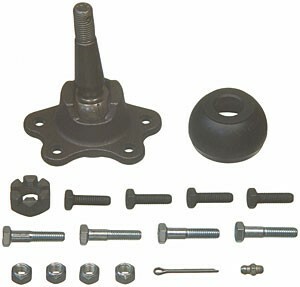 MOOG's ball joint housings are machined from a single block of fine-grain alloy steel to offer unmatched strength. Powdered-metal gusher bearings with grease grooves resist wear better than conventional designs. This innovative approach allows grease to flow through the bearing to the stud to create a smooth surface that extends service life. Load is transferred to the housing to enhance stability, and patented cover plates minimize radial and axial deflection to provide solid steering. Ball joint boots are sealed using polychloroprene and polyurethane to withstand dirt, abrasion, and temperature extremes. Boots also have grease relief valves to expel debris during maintenance to help prevent contamination.